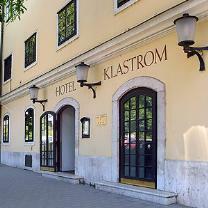 Both the building of Hotel Klastrom *** and its furnishing inside is cherishing the atmosphere of the former cloister of Györ. Our hotel offers you a complete refreshment in the sauna and solarium situated in the basement of the building.Our guests can also walk or jog on the wonderful "Rado Island" on the bank of river Raba very close to the hotel. More information about Györ and its other hotels!